In addition to this, they are comfortable to travel in, you get all sorts of food from food carts attending to every passenger, and they have smoking rooms inside the train which feels like some futuristic space pods. Need I say more to convince you how awesome they are? Anyway, we left Tokyo around noon and from being in one of the busiest cities in the world, we transitioned into the much calmer surroundings of Kyoto, in a matter of just a couple of hours. Alright, I'll be honest here. I had no idea what Kyoto will be like, but I knew it was the cultural capital of Japan. People say that Kyoto is the polar opposite of Tokyo, and I imagined there will be six out of the two thousand seven hundred and thirty five (imaginary number, please ignore!) shrines right outside the railway station. I was so ignorant that I thought buses were the only means of transportation in the city. When I came out of the station, all these myths evaporated faster than Virat Kohli starts swearing on the field. I am obviously not saying that it is the same as Tokyo is, it's just that I expected a relatively 'backward' place, more like a small town. But Kyoto has a well connected metro system, and even better bus connectivity. The roads were as clean as it was in Tokyo, the buildings almost as tall. Just like in Tokyo, every single person was well dressed, and not one looked deprived of food or money. Assimilating the brand new surroundings and getting amazed every moment, I took a bus from the metro station to the hostel. It was around 3 P.M already, and I was already behind schedule, considering I left Tokyo late (if you remember from the previous post, my friends left for Kyoto early, and I stayed back to visit the Tsukiji fish market in Tokyo). So I dropped my stuff, freshened up a little and left for the Fushimi Inari shrine. 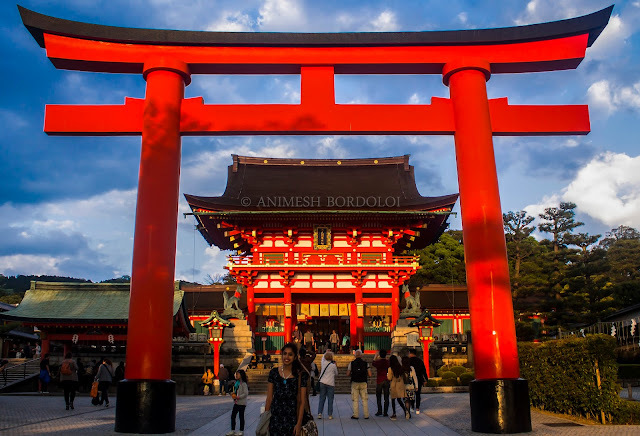 I don't want to bore you with a lot of history, but to tell you briefly, Fushimi Inari shrine is the head shrine of Inari. 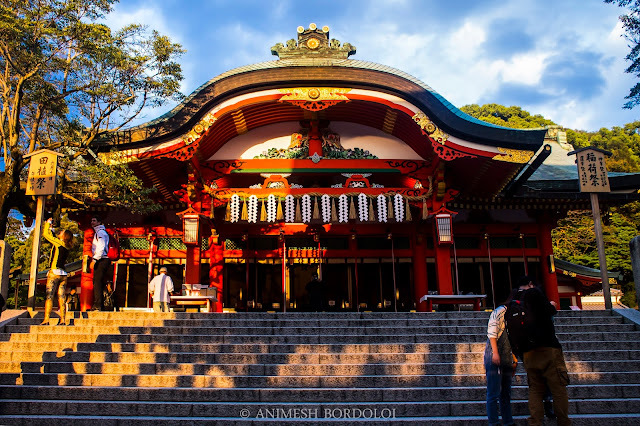 Inari in turn is a type of Shinto shrine, and Shinto is the ethnic religion of Japan. In short, this shrine has a lot of significance. The time was perfect when I reached the shrine. It was just before sunset and the mild, diffused light enhanced the beauty of this place. I roamed around the place, and then realized that this peace, this feel, wasn't there to be found anywhere in Tokyo. Maybe this is the difference people refer to, and I was slowly understanding it. By the time I was done exploring the shrine complex, it was past sunset, and I was lost and alone. I had no means to contact anybody, so I was sitting next to the shrine, feeling the calm more than ever. Fortunately, about half an hour later, I saw all my friends heading to the exit, and I joined them too. We had gone as a group of 17 but had hardly ever spent time together, owing mainly to my disappearances. So we all gathered, went out for dinner, and got back to the hostel to retire for the night. The next morning started quite late. 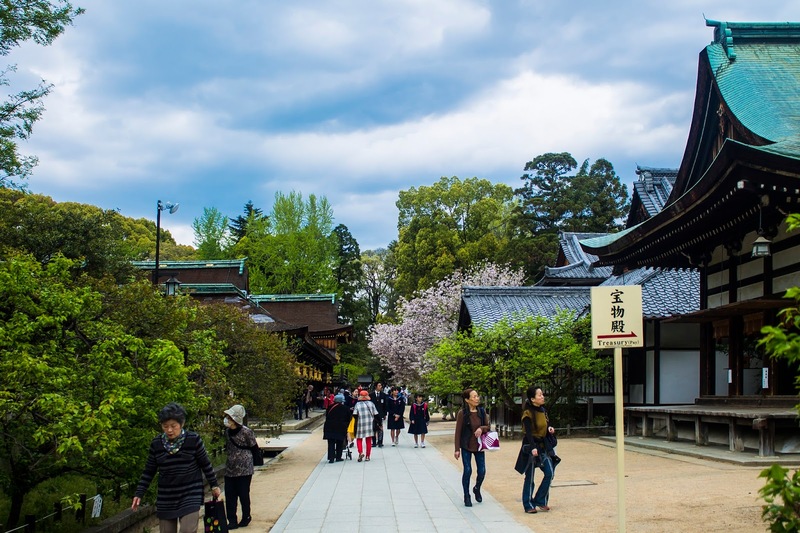 We were all supposed to go check out the flea market at the Kitanu tenmangu mae, and I was taking a walk around the hostel till the others got ready. The flea market is open only on the 25th of every month, and we were lucky that we were there for it. So after getting ready and having breakfast, we took the bus to go to the shrine. The flea market had a great variety of stuff, ranging from food, mementos, crockery and vintage items just to name a few. I thought I'll keep the shopping for later, and decided to check out the shrine first. The shrine looks really beautiful, and well maintained. I was alone as usual, and clicked away at everything which looked interesting and beautiful. The shrine is spread over a considerable area, so much so that it must have taken me more than an hour to explore all of it. By the time we got done with the shrine, shopping at the flea market and getting something to eat, it was close to 4:30 P.M. The plan was to go to Kiyamizu dera after this, but it would close by 6 P.M. and we would not be able to make it on time, so we had to call that off. So the entire evening was ahead of us with no proper plan in place. I decided to do what I like doing the best... to walk around the city and look at it from non-touristy eyes. We went back to the hostel, checked out some nearby shops for some more goodies, then left for the Gion district on foot. Gion, being a traditional entertainment district, is now Kyoto's most famous geisha district. By the time we went, it was close to 8 P.M and hardly anything was open inside. We were hoping to catch sight of a geisha or two, but no such luck. We walked around for about half an hour and then we exited. When I explain this in words it sounds pretty boring, but we did a lot more walking after that. In fact, baring a couple of hours we spent in a tiny pub somewhere, we kept walking around the city well past midnight. The walk itself wasn't unadventurous by any means. There is a river going through Kyoto, called Kamo. It is quite shallow, as deep as just 1 meter at certain places. We found places near the river to sit peacefully and just chill out. There were cherry blossom trees to enhance the experience and give a more Japan-feel to it. Then, as we kept walking aimlessly, we ended up reaching some red light area, where we could see suited pimps standing guard outside some buildings. Nobody told us this actually, but we figured it ourselves because we kept walking around the same loop again and again. As we were wandering here and there though, we spotted a couple of geishas in their traditional kimonos, escorting a few people to their taxis. A friend of mine got so excited that she almost ran after them to click a picture. I didn't do that though, so I don't actually have proof that I saw them at all. Damn, I should have taken one picture at least! I feel like I have mentioned this in one of the posts before too, but I'll say it again anyway. So at some point around midnight, we found a place right next to the street to sit. We left a few minutes later, but my friend forgot his phone there. He remembered a couple of hours later that he left it somewhere. So we traced our way back, having zero hopes of finding it, but when we reached that spot, the phone was kept there, untouched. This incident speaks volumes about a country and the values it imparts to its citizens. Someone could have easily sneaked it inside his/her pocket, but no, they do not steal. They even keep the cycles and bikes on the streets with keys in them, but nobody will ever take them. I was already in love with this country, and now I also had the utmost respect for them. Thanking our stars that he forgot his phone in a country like Japan and not anywhere else, we went back to the hostel. One of the most scenic places in Japan, the Arashiyama bamboo forest was yet to be covered, and it was scheduled for the next day, along with a few other places. To read about all that, stay tuned. My laptop broke down last week, so I got delayed uploading this post, but I will try my best to get everything back on track, and get my next 'Travel diaries' post up by next Monday. Have a great day folks! The photo of the river by night is out of this world.